This powerful general “All Purpose” formula was developed as a single source for cleaning in commercial/industrial environments. The greatly decreased hydrogen ion concentration (high pH) and balanced ORP (oxidation/reduction potential – measured in milli-volts) of The Janitor’s Answer® provides the necessary molecular energy for the maximum emulsifying and chelating action that is required to remove the oils, greases, protein, other substrate and invisible substances to which dirt, bacteria, fungus and algae adhere, and to remove carbon deposits and breaks down calcium and other scaling substances. 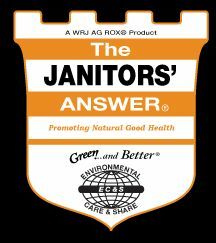 No need to purchase ship and store multiple products when The Janitor’s Answer® replaces what would traditionally require numerous products to complete an effective “Green” cleaning program. The Janitor’s Answer® excels in the effective cleaning of all hard nonporous surfaces including Plastic, Formica and Acrylic Surfaces. Great for Counters, Basins, Tile, Microwaves, Stove Hoods, Floors, Furniture, Leather, Stainless Steel, Ceramics, Office Equipment, Gym Equipment, Linoleum, Vinyl, Finished Wood, etc.